4 Millionth Hit Gift From Eddy Tang !!!! Thanks to visitors like yourself, The Madman's Cafe ressurects once again and celebrates its 4 Millionth Hit!!! Thanks to Eddy Tang, Final Fantasy X's Lulu is present to celebrate the occasion. 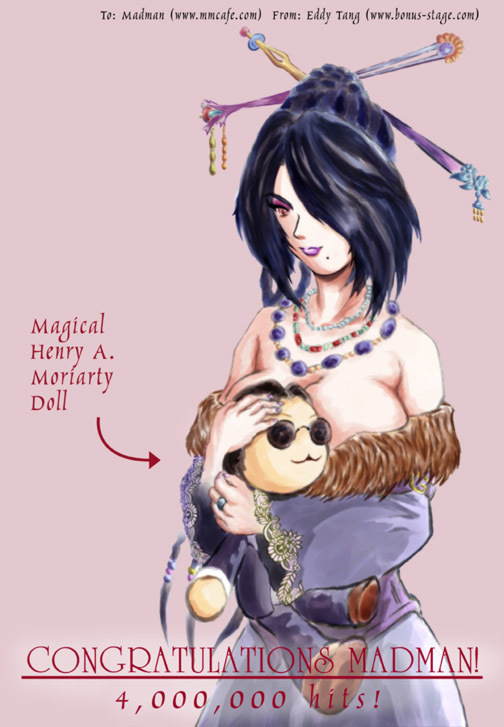 And.. ... that doll she's carrying. Thanks, Eddy! For more interesting artworks by one of the first net fan artist when the WWW began, check www.bonus-stage.com!